For SATB chorus and soloists, unaccompanied; premiered Sunday, October 21, 2007, 10:00 A.M. at S. Stephen's Church in Providence, Rhode Island; Schola Cantorum of S. Stephen's Church under the direction of James Busby; performed as part of the service. Commissioned by S. Stephen's Church. Missa Sancta Stephani was commissioned by James Busby for the Schola Cantorum of S. Stephen's Church. It is a missa brevis, a setting of the Latin mass minus the Credo. While the work pays homage to musical traditions of the past, it combines conservative harmonic language (each movement is in a specific key) with a distinctly modern sensibility. There is special attention to the use of text, and word painting is abundant throughout. 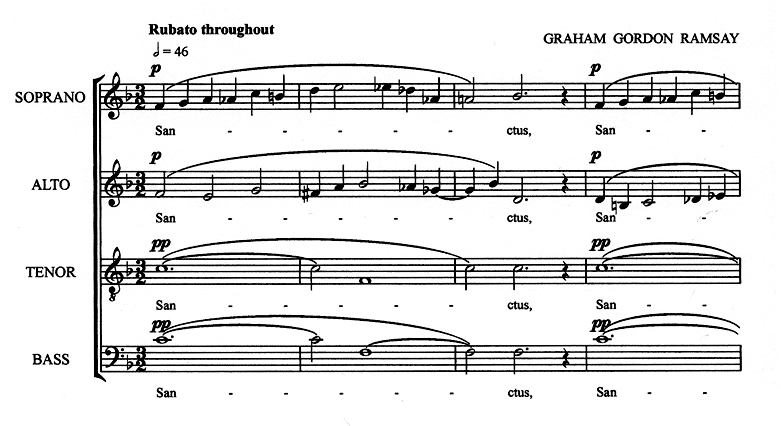 In addition to the choral polyphony of each movement, the Kyrie, Gloria, and Sanctus/Benedictus feature solo voices which provide contrast and underscore key elements within the text. The work runs aproximately 15 minutes in length.